The R&A have decided that in future the number of local qualifying venues for the Open Championship will be reduced and 2013 will be the last local qualifying to take place in East Lothian. 36 holes were played at North Berwick, Dunbar, Gullane, and Musselburgh with three qualifying spots available at each venue. The leading qualifier at North Berwick was 19 year old Royal North Devon amateur Jimmy Mullen who closed with a birdie for a second successive 68 and a six-under-par total of 136. George Murray the pro from Anstruther carded a 64 when he eagled the last, driving the green at the 288-yard par-4 and rolling in a six-footer for a total of 137 and a share of second place with Welshman Gareth Wright (West Linton) and Irishman David Higgins (Waterville). The trio set out in a play-off for the final two spots only for disaster to strike Higgins as he was hit with a two stroke penalty for discovering he had 15 clubs in his bag - one more than permitted, and was penalised two shots. His local caddie said " he put a fairway club in his bag when he finished his round thinking he'd be going home and then he discovered it on the first hole". 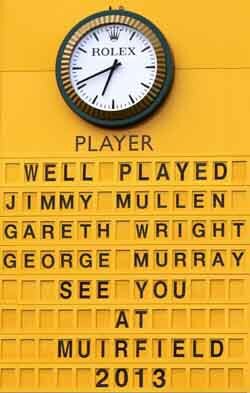 It meant Wright, who birdied the first play-off hole following a superb approach, and Murray who made par, both progressed along with the leading qualifier Jimmy Mullen. Higgins said later, "He felt his five-under total had little chance of being good enough, so he dried-off and stored his equipment, including a spare rescue club in his car. He had two hours to kill before the last group finished and during the waiting time he was delighted to see he was moving up the leaderboard and became more confident that he could get one of the spots available in the play-off. I decided to go to the range to warm up again and hit a few balls. It was still raining really hard so I kept the rain cover on my bag. My caddy for the day, Monty, a local man that knows North Berwick like the back of his hand, had done a great job all day and was up for the play-off. We headed for the tee, I hit a good tee shot and good second to about 15 feet. I was hunkered down reading my putt when the thought suddenly came to me - did I take that other rescue out of the bag? I have no-one to blame only myself. I guess the excitement of getting another opportunity to play in the greatest golf event in the world clouded my judgement and I made a mistake". The qualifying day was the last significant rainfall for three weeks and with temperatures of 27 degrees the fairways at Muirfield were baked dry. 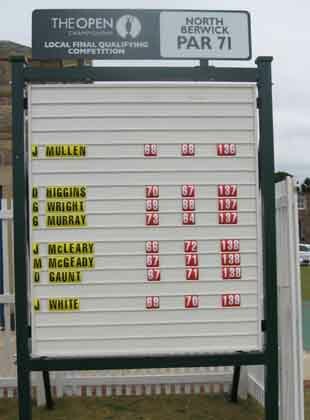 George Murray narrowly missed the cut, while Gareth Wright made it through to the third round and Jimmy Mullen received the bronze medal for being runner-up to the leading Amateur. In the days before the championship started, Luke Donald played the West Links at North Berwick with nine of his friends including football pundit Jamie Redknapp. The World No.9 asked North Berwick Golf Club for permission to play off the white tees but was refused. He was also charged the full green fee. Luke took it all in his stride, shot a six-under-par 65 and enjoyed the hospitality in the clubhouse. The following day Alvaro Quiros the 29 year old Spanish golfer rolled up for a game over the West Links, and was also asked to pay the green fee, he decided to walked away. American Johnson Wager was much more pragmatic, suggesting on the day the difference between the white and blue tees was insignificant but he objected to paying the green fee. Stewart Cink (using a trolley) and his caddie Matt Hall enjoyed the course, so did Jim Furyk's caddie Mike Cowan, who played as a single. 'Rules are Rules', but even the golfers in North Berwick were ashamed when Mike Davis USGA Executive Director was also charged the full green fee to play off the blue boxes. On Sunday evening following the first practice round at Muirfield, Bubba Watson, his caddie Ted Scott and Jens Beck one of Watson's managers played the West LInks at North Berwick. When word spread that Bubba was on the course a number of youngsters playing on the adjacent Children's course gathered to followed the 34 year old American. On the 15th green (Redan), Bubba had the kids lined up each attempting to hole their putt with Bubba's encouragement. On the 16th fairway Bubba carried the bag for one youngster who will never forget the day the Master's Champion caddied for him. Not to be out classed, his caddie Ted Scott drove the 385 yard, par 4, 14th green and holed out for an eagle three. Geoff Ogilvy, Nick Watney, and Russell Henley played the West Links while Tim Clark, Carl Petterson, Freddie Jacobson and Scott Stallings walked the course. Justin Rose also walked the course taking photographs of the #16 which he posted on Twitter with the comment 'One of the most amazing greens in the world.' American pro Brandt Snedeker took a liking to our Scottish Tennent's Lager in the Golfers Rest on the High Street where he bought the staff and customers a drink. He was joined there each evening by his caddie Scott Vail and they donated a golf bag to be auctioned in the pub's charity campaign. Snedeker tied for 11th place at Muirfield. The 2013 Masters's Champion Adam Scott and his father played a few holes on the picturesque Glen Golf Club, North Berwick where it was reported that he covered the 336 yard first hole with a seven iron and a pitching wedge. Miguel Angel Jimenez led the Open championship after the second round and was greeted by spontaneous applause on Friday evening when he entered the Cucina Amore restaurant in Quality Street, where he enjoyed the local lobster. On the morning of the final round, BBC sports anchorman John Inverdale was spotted leaving the west beach at North Berwick after an early morning swim. He said it was invigorating the only way to start the day. 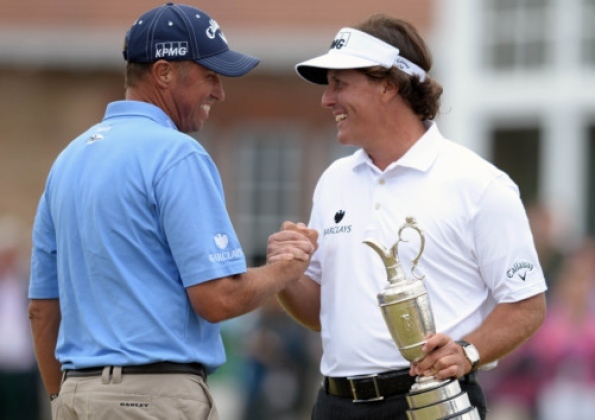 The winner of the 2013 Open Championship was Phil Mickelson with a closing round of 66 for a total of 281. Mickelson was staying with his family in the Marine Hotel (Room 224) in North Berwick. During the final round at Muirfield, Mickelson's putting was described as remarkable and he suggested this was due to his practicing in the evening after nine o'clock on the West Links at North Berwick. The 16th green situated beside the garden gate leading to the Marine Hotel has a deep swale bisecting the middle which Phil described as the 'craziest green in the world'. In the evening Mickelson would order ribeye steak served in his room, and later he would come on to the course with his daughter and enjoy just hanging around and putting. When Mickelson came back with the Claret Jug, the staff rolled out the red carpet and lined up to give him a great round of applause. The R&A booked out the Marine Hotel in North Berwick where over 40 golfers resided including Tom Watson, David Duval, Mark Calcavecchia, Todd Hamilton and Hunter Mahan. Tom Watson and Paul McGinley, the two Ryder Cup captains had dinner together in the hotel restaurant on Sunday evening. It was a return visit to the Marine Hotel for Tom Watson who stayed there during the Open in 1992. He said North Berwick is a 'favourite spot' and he enjoyed a wonderful walk from the Marine Hotel across the golf course to the town. Fred Couples was spotted enjoying a drink sitting on a bench outside the North Berwick Clubhouse. He was quite happy signing autographs while he waited for his friend the Vice Chairman of the PGA of America Rules Committee completing his round over the West Links. During the Open Championship Goran Zachrisson the Swedish TV equivalent to Peter Alliss arrived at Tantallon Golf Club in North Berwick to renew old friendships. Although he plays most of his golf in Sweden he is also a member of Royal Liverpool Golf Club and played in an inter-club match against Tantallon at Hoylake in the 1990s. He was invited to return to Tantallon with his Swedish TV colleagues who were covering the Open at Muirfield. The following evening Goran arrived with Per-Ulrik Johansson, Pierre Fulke and a couple of Swedish TV executives. Goran, now in his eighties, was presented with a copy of the Tantallon History and a very enjoyable time was spent 'talking golf'. Per-Ulrik Johansson played twice in the Ryder Cup 1995, 1997 and Pierre Fulke represented Sweden in the Ryder Cup in 2002. Johansson attended Arizona State University with Phil Mickelson. Copyright © Douglas C. Seaton, All Rights Reserved.